Design is largely a matter of opinion, but the precious metal content of a nation’s coins is an entirely different matter: There is no room for error or even the slightest impropriety. So serious was Congress in this regard that the Coinage Act of 1792 required $10,000 personal bonds for each of the Mint officers holding a fiscally responsible position—before gold and silver coins could be minted. The Chief Coiner and Assayer, entrusted with overseeing supplies of bullion and coins on hand, were unable to raise such a staggering sum, precluding coinage of the larger denominations in 1793. At the urging of Secretary of State Thomas Jefferson and President George Washington, Congress relented in early 1794, lowering the bond requirements to more reasonable levels. 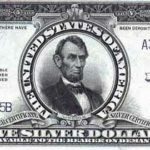 The bonds were posted and silver coins, starting with the half dollar and dollar, began to appear in the Fall: The gold coins would have to wait until the following year. In June of 1795 Henry DeSaussure replaced David Rittenhouse as Mint Director. His initial goals were to begin striking gold coins and improve the current coin designs. Under Rittenhouse’s orders, Chief Engraver Robert Scot had already prepared dies, and on July 31, 1795, 744 half eagles were delivered: the very first gold coins produced by the United States Mint. Scot’s depiction of Liberty on the new coins was a Classical design, modeled after a Roman-style Hellenistic Greek goddess, with hair rearranged and a large cap. The bust was draped so as not to offend “modern” eyes of the late 18th-century with the easy sensuality of the ancient motif. An onyx cameo from first century Rome inspired the reverse, which bears an eagle with wings outspread, holding a wreath in its beak, and a palm branch in its claws. The small and stylized eagle was often called a “chicken eagle” by early citizens, a name sometimes heard in the numismatic community of today. 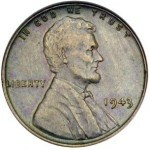 Along with the date, only the inscriptions LIBERTY and UNITED STATES OF AMERICA are found on the coin: no denomination or statement of value appears. Only 18,512 Draped Bust Small Eagle fives were produced from 1795 through 1798, and most didn’t escape the huge melts that later destroyed the bulk of U.S. gold coinage minted before 1834. Survivors, particularly in high grade, are very scarce. By far, the most common date of the series is 1795: With 8,707 minted and many saved as first year of issue “souvenirs,” this is the date seen most often in type sets. It is generally found with bright, prooflike fields, and often with lint marks—vestiges of lint from the soft cloths used to frequently wipe and polish the dies. Choice mint-state specimens exist, but are very rare. Even the seven examples of this date in the famed “Eliasberg Sale” only ranged from XF to AU. An interesting error of this year is the S over D variety, a blunder created when the word STATED was first punched into the reverse die, and then corrected by overpunching the D with an S.
All Draped Bust half eagles from 1796 are overdates—1796/5—and are considerably more difficult to locate than the first year issues. Very few exist in mint-state. Half eagles struck in 1797 are of two types: either 15 or 16 stars are on the obverse. Both are rare, with the 15 star variety somewhat more elusive. 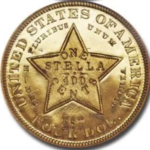 The 16th star was added after Tennessee’s admission to the Union. The 1798 issue is the key of the series, and with only seven traceable specimens, is one of the rarest half eagles of any date—and the coin that prevents collectors from attempting complete “date” sets of this design. This issue was unknown until 1865, when W. Elliot Woodward discovered the first specimen. Mint records are vague on when these last Small Eagle fives might have been struck, but numismatists believe they were either the first 691 pieces produced in 1798, or part of an emergency issue of half eagles struck in December 1797, after the yellow fever epidemic of that summer. In the rush to resume production, any available dies were pressed into service. Researchers believe a similar epidemic and Mint closing the following year were responsible for the enigmatic 1795-dated Heraldic Eagle fives. In this era the Mint commonly used all dies until they were no longer serviceable. Obverse and reverse dies were used haphazardly in different years and in different combinations, accounting for many unusual and out of sequence die-pairings so often seen on early coins. When grading this design, obverse wear first shows on Liberty’s hair, cheek, shoulder and cap. On the reverse, check the eagle’s wings, breast and left leg. 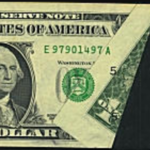 Frequently seen on these early fives are adjustment marks, parallel lines made by files used in adjusting overweight planchets. These lines generally survived the striking process, and while adjustment marks may not affect a coin’s technical grade, they do influence its value. Counterfeits are usually not encountered of this series, but altered dates do exist, simulating the rare 1798 issue. Early fives, along with large cents, were among the first issues collected as the hobby took root in the mid to late 19th-century. Later, as numismatic scholarship advanced, some collectors such as John Clapp and Walter Breen turned their attention to die varieties. Today only a few dedicated specialists still form collections based on these variations. The vast majority of collectors pursue these coins for type sets. 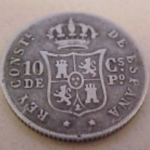 The Small Eagle series of half eagles ended early in 1798. Scot’s Heraldic Eagle design for the reverse—adapted from the Great Seal of the United States—appeared on the later issues of that year, and continued through 1807. Made for more years and in larger quantities, the Heraldic Eagle type is found much more regularly than its predecessor. Rarely is a Small Eagle five seen on a bourse floor—usually only major auctions offer a specimen. Its simple, yet elegant, design—coupled with its status as the first type of half eagle, makes the Small Eagle five truly an American classic.